I am now officially Oliver Jackson Bsc Hons. At frickin’ last! Only took five years! Yesterday seemed like the longest day ever, stuff just kept happening. I woke up far too early as I was all excited and nervous about the day ahead. Kerry and I got all dressed up and then went to Favorit for breakfast, where I could hardly eat anything. Then we met my parents and I went and got robed-up and chatted with my buddies. 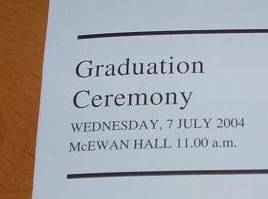 At about 10:30 we decided we’d better go in to McEwan Hall and take our seats. There was an organ recital and then they got down to the task at hand. What follows is basically an hour of clapping and shuffling along seats. Getting their degress with us was the Engineering school and they all went before us. When your name is finally read out and you’ve successfully shuffled along to the end of the row you march up to the stage (without tripping) and get hit on the head with a ceremonial hat. You then exit stage left, get your certificate and shuffle back into your seat. After graduation there was lots of milling around outside while everyone’s Mum cried and the family took photos. We eventually managed to organise a group of us into a photo, not the easiest of tasks. Check out the gallery for the photos. After I’d handed back my hired robes (not cheap!) we went back to Favorit for lunch where they managed to annoy my parents by completely forgetting their orders, pretty dumb if you ask me. They did eventually get served, needless to say the tip was a big fat zero. We now had time to kill before the reception in the afternoon so we mooched along to the Royal Musem where I sat down and spaced-out for half an hour. The reception in the afternoon was in Surgeons Hall which is pretty impressive on the inside, filled with interesting paintings and rooms. It was a fancy affair with canapes, champagne and little sausages. There were some prizes awarded and we were told to have a good time. At this point we were knackered so we went home for a wee rest and then got changed for dinner at the grainstore at seven. The grainstore was very, very nice. I had smoked haddock and pea risotto to start and then aubergine, courgette and something lasagne with red pepper fondue. Both were fantastic and didn’t leave me room for pudding. Kerry and I then took my parents on a mini pub tour of Deacon Brodies, Whistle Binkies and then finally Beluga. My parents then went off back to the hotel and we went to find the new-graduate gang. There were still at the pear tree where we rapidly formulated a plan to go to Why Not? on George street. After much faffing and two almost bar fights we eventually got taxis there. Quite a few of our number were too pished to get in unfortunately but they’d had enough by then anyway. Kerry and I were still sober enough to get in (of course) and had a great time with the gang. Kept seeing more and more people from c.s. through the night. Kev and Rab were busting some legendary moves on the dance floor and Ian and Daniel was splashing out on some £50 a pop champagne. We lasted until 3am when we got a taxi back with Kev and collapsed into bed. Only for both of us to get up for work this morning. Ouchy.